Sometimes when you’re traveling or planning a vacation, the last place you’d want to stay in is a hotel. No doubt, they are easy to find and convenient and good for long stays, but the whole idea of someone else making your bed thing can be boring at times. Fortunately, for someone looking for something out of the ordinary, vacation rental homes or homestays would be a great alternative to standard hotels. Of course, you get the same feel and all the nitty gritty details come down to just one thing – how two things can be so alike and so different at the same time. Lucky for you, there are tons of options available for travelers and backpackers alike looking for rental homes rather than hotels. Airbnb and VRBO are the two names come to mind when you think of booking a short term vacation home. They are two of the biggest players in the travel industry specialized in vacation home rentals. Airbnb is a major player in the hospitality and travel industry specialized in short-term vacation rentals allowing travelers to customize their lodging much more than traditional hotels do. It is an online marketplace and one of the largest providers of accommodation in the world with over 4 millions listings in over 190 countries with US being the top marketplace with over 660,000 listings. Airbnb revolutionized the travel industry by actually making the Bed and Breakfast concept easily accessible to the normal person. With Airbnb, almost every person with a normal apartment or a house can rent out a bedroom space or even the entire house itself. VRBO, short for Vacation Rental By Owner, is an online marketplace that allows property owners to list their accommodation for rent. HomeAway owned VRBO is a full space rental service in which vacation rental owners pay to advertise their space. 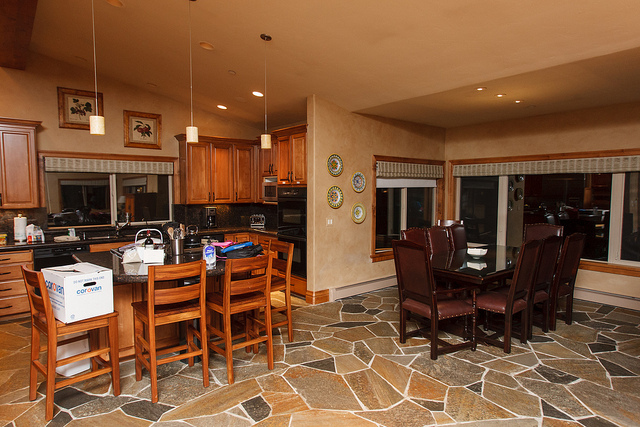 It offers rentals for both families and groups in privately owned condos, villas, cabins, or even farm houses. Unlike Airbnb, travelers need to rent entire house on VRBO rather than renting a single bedroom or apartment. VRBO excels over Airbnb for its extended suite of filters which allow users to search by location type – beach view, lake view, etc. – as well as other property types for a better user experience. Founded in 2008 by Joe Gebbia and Brian Chesky, Airbnb started originally as an air mattress rental service called “Air Bed and Breakfast”. Over time, it became one of the major players in the hospitality industry specialized in short-term vacation rentals including homestays, cottages, apartments, hostels, etc. It’s a one-stop destination for travelers looking for short-term vacation rentals. VRBO, short for Vacation Rental By Owner, is Austin-based company vacation rental marketplace that offers rentals for families and groups in condos, cabins, villas, barns, castles, and even farm houses. It was acquired by “HomeAway” in 2006 and joined the HomeAway family of vacation rental marketplace. RBO has been a boon for travelers worldwide with the most number of higher-end rentals. Like Airbnb, anyone can list on VRBO, but unlike Airbnb, you have to rent entire homes on VRBO. While Airbnb is great for short stays, VRBO focuses on bigger rentals for long stays. It’s free to list your space on Airbnb. However, a small processing fee is charged only when a place is booked. For guests, it charges a 5 to 15 percent fee when a reservation is confirmed. However, the service fee for guests may vary depending on the total cost. More the subtotal, less the percentage of service fee charged. The VRBO service fee is calculated on a sliding scale based on the cost of the rental in between 4 to 9 percent of the rental amount and will not exceed $499. VRBO is a good choice over the pay-per-booking model of the Airbnb. 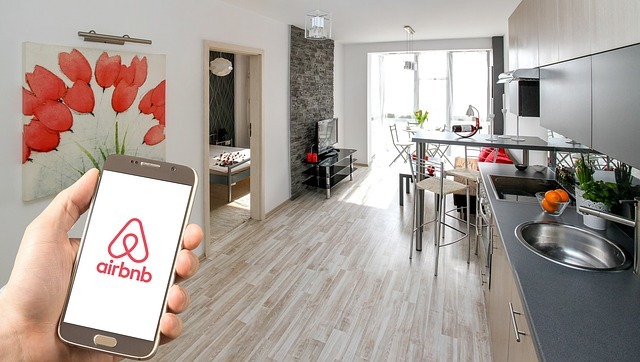 Airbnb provides the best mobile experience, whereas VRBO excels in terms of web experience. Airbnb is more focused on the user experience, thanks to the “experiences” section that allows users to discover activities near their destination which include hiking, beach yoga, walking tours, etc. Airbnb also requires their guest to create account, whereas no accounts are required to go to VRBO’s website. And the best part, VRBO allows hosts and guests to communicate in any way they want. However, Airbnb only allows communication via their website and any attempt to send a contact number or email address would be blocked. In a nutshell, it all comes down to what kind of trip you’re planning or already planned and what type of accommodation you’re looking for. If you’re looking for a short-term stay and want to go with the popularity itself, then Airbnb is the one for you. Plus it also features “experiences” section to make your trip more adventurous and fun-filled. However, if you’re looking for a more catered experience for a full vacation and if you don’t mind renting the whole house, then you should go for VRBO. All things considered, both of them offer a range of tools and rental options to choose from. At the end of the day, it’s all up to you. Sagar Khillar. "Difference Between Airbnb and VRBO." DifferenceBetween.net. 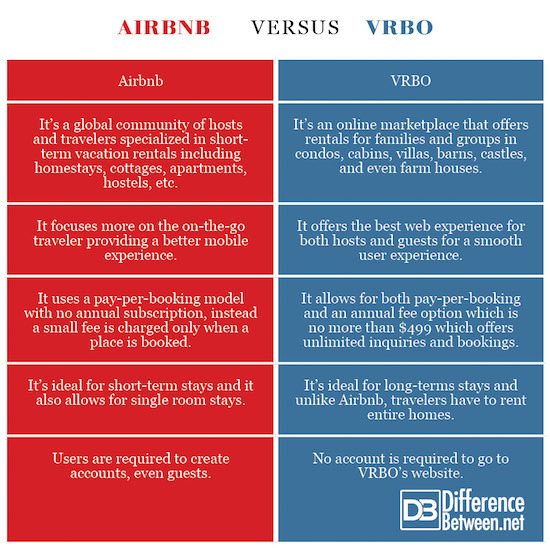 July 23, 2018 < http://www.differencebetween.net/technology/difference-between-airbnb-and-vrbo/ >.